Our silver price forecast for 2019 is mildly bullish. However, there is one wildcard which may make our silver price forecast for 2019 wildly bullish. Continue reading, and learn how InvestingHaven’s research team looks at markets. Note that our silver price forecast for 2019 has a baseline prediction (midly bullish) as well as a bullish prediction. We believe silver (SILVER) hit a major bottom on August 14th, 2018. That’s when there was bearish momentum, and many were forecasting that silver would fall below $10. Our leading indicators were screaming “major bottom” and so, as per our discipline to our method, we were confident that the drop of silver to $14 was the bottom of the year. Note that we were very vocal on our prediction, as on the day of the bottom, when everyone was as negative as possibly imaginable, we came out in the public with our silver price crash article which included our ‘this is a major bottom’ forecast. That said, what is 2019 going to bring? In forecasting the price of silver there is one thing that must be foremost our mind: not making mistakes by looking at lagging indicators. We know of two misleading indicators. First, the silver news. It is very easy to get caught up in chasing the news to understand where the price of silver, like the price of any other asset or market, is moving. The biggest illusion is reading news to forecast potential future price points. Never, really never, will this work. Bloomberg reports how the mighty dollar and trade fears push down silver prices in September. One week later Bloomberg publishes this article on the highest silver to gold ratio in decades and a gold fund outflow vs. silver fund inflow. Marketwatch follows in October the downtrend in gold and silver. One week later Marketwatch favors silver above gold. This leaves any investor with the question “so what” or “what now”? Way too hard to make something meaningful out of this, so investors need another ‘method’. Second, reading inflation indicators to understand the future price of silver. Many make the mistake of following CPI-alike indexes for gold or silver forecasts. It doesn’t work, as precious metals do not only move on inflation changes. They are more ‘sophisticated’ so to speak, it is not a one-to-one correlation with inflation that makes them move. Third, the correlation between silver and base metals is certainly a fair indicator. However, it is not the only one. So a silver price forecast of a 50% rally like this one solely based on the base metals price correlation will not work. Visibly, it did not work, as the silver price is far from the 50% rise they forecasted. The first leading indicator for our silver price forecast 2019 is the price of gold. As said many times the price of gold is the leading indicator for the precious metals complex as it tries to turn its bear market into a bull market. In 2001, when gold stopped its decline, it started its bull market, and only later did silver follow. Silver underperforms when gold starts a new bull market. At major tops, however, silver tends to be the one to outperform, similar to April 2011, after which gold set its major peak 6 months later. Gold, right now, is in the process of setting a giant cup-and-handle. This would be bullish for precious metals, and silver in particular, though silver may follow gold’s path with some delay. The second leading indicator for our silver price forecast 2019 is the Euro. In recent years, the Euro has been leading the price of gold. Every time the Euro tested secular support or resistance, or broke out or down, it preceded an important top or bottom in the gold price. For 2019 it seems that the Euro is moving in no man’s land, at least based on the current trend. The Euro has a track record of moving fast once it breaks out or down. Also, near secular support or resistance it tends to stay there for a while. Currently, though, we don’t see any of this. As the Euro does not seem to be providing a negative direction to markets we interpret this is neutral to precious metals. The third leading indicator for our silver price forecast 2019 is the Commitment of Traders report. 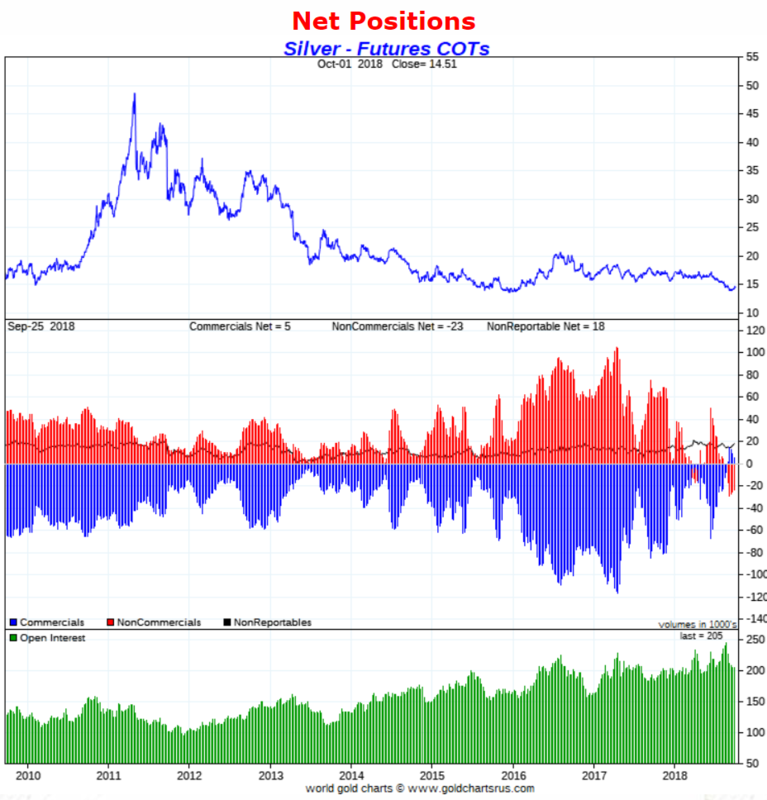 The Commitment of Traders report, in short COT, shows the silver futures market positions of large traders. The silver COT report shows how extreme the current situation in the silver market is. How to read the silver COT chart? The extreme levels in the center pane are the ones to focus on. The closer positions are to the zero line, the deeper the bottom that will be set. This may vary if the silver market is in a bull market vs a bear market, but the point is that extreme positions cannot last for a long time. Never before in recorded history of the silver futures market have we seen such extreme levels. Extreme hedging, whatever it means, is what is happening, and that of course has to resolve and normalize, through higher prices. There is one wildcard we will use for our silver price forecast for 2019: interest rates. As explained in our piece Major Turning Point: End Of 40-Year Bull Market In Bonds there will be seismic shifts in markets in 2019 and beyond once 10-year Treasury Yields confirm their breakout above 3.10. This quote is one of the most important ones you will read in 2019! A massive level of capital, never seen before, in the order of $40 trillion, will start moving around. Obviously, not all of it, but a considerable part will move elsewhere. Can anyone imagine what will happen if this becomes a trend into the same direction. Correct: stampede. One of the potential scenarios is that the massive outflow out of the bond market will push capital to stocks and commodities. Consequently, capital will flow out of the US Dollar. In such a scenario we expect a sudden hit of inflation. If, and that’s a big IF, that were to happen, we see a sudden rise in commodities and inflation indicators which, combined, will push the price of silver much higher in 2019. The probability of this top happening is 20% according to us. As the gold price is the leading indicator for precious metals, in other words being the first one to lead precious metals out of their bear market, it is worth following the silver miners to gold price ratio. The silver miners to gold price ratio can tell us whether silver miners outperform the price of gold, in other words if silver miners rise faster than the gold price. This may feel somehow similar to the gold to silver price ratio, but it’s one on steroids. We believe it is worth checking this ratio not as a leading indicator but a secondary indicator, primarily to understand if the gold price rise or fall is having exponential effects on the silver market. Silver miners tend to move sharper in both directions, so it’s a clearer indicator than the gold to silver ratio. This ratio tested a crucial level in Sept 2018 a crucial level. As long as this holds we believe it will be great news for silver and silver miners. This secondary indicator suggests it is great news if 0.019 holds, and would be outstanding once the ratio rises above 0.024. The weekly silver price chart has one important message: the double bottom against December 2015. If this double bottom holds, which we forecast based on the leading indicators mentioned above, we conclude this will have a bullish effect on our silver price forecast for 2019. However, the weekly silver chart is not sufficient. We have to zoom in to the monthly silver chart in order to understand dominant trends. Silver’s monthly chart has some crucial insights, in particular 4 of them, each one indicated with a figure on the chart. Trendline (1) suggests the long term uptrend is not broken yet. Support (2) says there is major support at $13.50 which implies this price level will likely hold but also means it will have major bearish implications if it breaks. Band (3) in which silver moved 2y ago is a less bearish band. Silver makes it into chart area (4) once silver rises above $16.00. We believe silver will rise to area (4) in 2019, and, depending on the USD reaction on the end of the 40-year bull market in bonds, inflation may hit in 2019 and 2020, pushing silver about formidable resistance at $21.50. So what is our final call on our silver price forecast for 2019? Our baseline forecast is $17 to $21.50. We prefer to work with a range, not a specific price point. That’s area (4) on the chart below. However, if the bond market outflow, as explained above, results in an inflow of capital in commodities and stocks, resulting in a sudden rise in inflation and ‘risk on’, we will see a strong breakout in silver above $21.50. In that scenario we forecast $26 for silver in 2019. The probability is just 20% though. Update on November 4th: Inflation as another catalyst for higher silver prices in 2019? This section was added on November 4th 2018. Prices for a lot of things in everyday life are going up. Especially CEOs are flashing a warning about this as explained in this recent video. There is more evidence of consumer price inflation. In the consumer space many product prices have increased in the recent 12 months. A McDonalds Big Mac went up 4.7% against a year ago, Starbucks rose their price of a freshly brewed coffee by 8.9%, one of the popular Domino’s pizza went up 5.9%. When we check the chart of StockCharts’ inflationary indicator, and overlay it by the precious metals indicator (gold price), we find a relatively strong positive correlation on the high level direction of both. Primarily secular double bottoms and double tops seem to be a reliable indicator and ‘catalyst’ for precious metals prices, in both directions. After inflation’s giant double bottom of 1999/2001 and giant double top of 2008/2010, it might be setting up for a giant double bottom in 2016/2018! The chart indicates the major double bottom in 1999/2001 (with a higher low) and the major double top in 2008/2010 (with a major lower high). In a somehow similar fashion the 2016 major bottom may be a higher low against the 2018 bottom. This inflation data point provided more evidence of higher precious metals prices in 2019 though more as a secondary indicator. It shows a giant double bottom, which, as well, is bullish in nature! It also confirms a bullish start of 2019. It shows a higher low, especially against the December 2015 low. A higher low is a bullish long term signal. What we can derive from this weekly silver chart is a price target for 2019. We see a congestion in 2017 and 2018 in the 16.5 to 18.0 area. That’s our first price target. Our most bullish case is the top of the previous decline. It would be in the 20 to 21 area. This is really feasible for silver to get there. We see major breakouts taking place in the precious metals space. One of the ratios we see breaking out is the silver miners to S&P 500 ratio which we feature below. They are all about to confirm that our silver price forecast 2019 is about to get confirmed! Let’s first start with the silver price though. The weekly silver price chart looks gorgeous, literally! The 2 year downtrend is now giving way to an upside breakout. Needless to say, just this one fact is almost the confirmation for our silver price forecast that we are looking for. The double bottom 2016 against 2018 was confirmed, and now a break of the downtrend is about to get confirmed as well. The monthly chart does not show right away a new insight compared to the weekly chart above. However, the devil is in the details. A very sharp eagle’s eye does notice something that nobody else sees. We did annotate with green dotted lines what may be taking place as the start of a future rising channel. This is the beauty of chart analysis: forecasting future price points or future trends based on current data points that nobody else is able to see at the time of writing. The lowest resistance point of this future channel is between $20 and $21. No coincidence this is also our baseline price target in the context of our 2019 silver price forecast. The most bullish target is $28. Here as well no coincidence as we did pick this price target more than 6 months ago at the depth of pessimism and bearishness in precious metals! Surprisingly, at the same time interestingly, there is no news whatsoever on this major event in the silver market. It is beyond us. We watch this major news aggregator in their silver news section and hardly any news to see which comes close to our news update! Furthermore, Google’s news aggregation service does even show that not any of the major news outlets like Bloomberg or Marketwatch or Forbes are writing about the silver price. Just to be clear, at InvestingHaven, we literally love silent bull markets for the reasons outlined in our 10 Tips To Master Investing Without Emotions. The silver miners to the S&P 500 is a ratio that we follow closely, and is revealing a giant breakout already! The way to interpret this ratio is ‘relative strength’. If and when silver miners rise faster than broad markets this ratio goes up. This ratio broke out a few months ago. However, just a little bit of work is needed to confirm this breakout. A small push higher in silver miners is needed. We especially like the double bottom against Jan 2016 on this chart. This is very powerful (read: bullish) when combined with our gold and silver price forecasts as well as gold and silver miner trends. As our silver forecast 2019 is well underway, the key question is whether and when to take profits off the table. Depending on how our leading silver indicators as well as gold indicators evolve throughout 2019 we will ensure to inform our followers if and when news insights about an exit plan become clear. Follow us for updates on when and how to exit the silver market in 2019 and beyond. How to play the silver trend, and invest in silver? How to invest in gold? Very simple, there are 2 options to get exposure to silver. One solution is to buy SLV ETF: very easy to buy on any exchange but it is a ‘paper based’ investment. 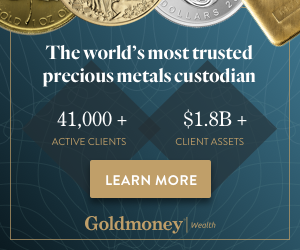 The other solution is to open an account with GoldMoney and buy/store physical silver for you in a couple of simple steps. GoldMoney is one of those online precious metals services that is very reliable.